The majority of hate crimes reported to police in Finland in 2011 were racially motivated, and the police reportedly recorded the highest number of racially motivated hate crimes in 2011 than at any other time in more than 10 years. The end of each year is always an interesting time. Besides holidays, parties and new year wishes and resolutions, many organizations and bodies release statistics that put events during the year or the previous year into perspective. One of such statistics, which I always look forward to, is Finland's hate crime statistics published by the Police College of Finland and the Ministry of Interior's Police Department. The 108-paged report published this year reviews hate crimes reported all across Finland in 2011. It reveals that in Finland, people are physically attacked on grounds of race, ethnicity, sexual orientation or disability, and as a hate crime motivation in 2011, race won by a landslide. The report, titled Poliisin Tietoon Tullut Viharikollisuus Suomessa 2011, reveals that Finland saw an increase in racism and racial abuse in 2011. Police recorded 918 crimes that were suspected to be motivated by hate - a 7 percent increase compared to 2010. According to the report, majority of the crimes, 86 percent, were racially motivated. The report brings to light the fact that most racist hate crimes were committed in the evening and at night in public outdoors such as streets, roads or market squares. Restaurants, bars and dance spaces were also racist crime scenes. A surprisingly high number (12 percent) of suspected hate crimes were committed in victims' residential areas and staircases. In this internet age, it is worthy to mention that the internet accounted for 2 percent of suspected hate crimes. Religious background motivated 6.6 percent of the cases, sexual orientation motivated 4.6 percent, disability motivated 2.6 percent and three hate crimes (0.3 percent) were motivated by victims' transgender identity. Assault was the most common form of racially motivated hate crime between 2003 and 2011. (See page 55). By municipality, Finland's capital city, Helsinki, accounted for the highest number of suspected racist crimes reported to the police in 2011, followed by Vantaa, Turku and Espoo. By region, racist powerhouses included, Länsi- and Itä-Uusimaa (with Helsinki as capital), keski-Suomi (with Jyväskylä as capital), Pirkanmaa (with Tampere as capital), Pohjois-Savo ( with Kuopio as capital), Etelä-Savo (with Mikkeli as capital), Pohjois Karjala (with Joensuu as capital), Varsinais-Suomi (Turku as capital) and Satakunta (Pori as capital). Looking at a map on page 53 of the report, central, eastern, western and southern Finland could be aptly described as hate crime hot spots. Somalis, according to the report, were the most targeted group. This puts into perspective results of a poll commissioned by Helsingin Sanomat in 2011 that showed that Somalis are most affected by racism in Finland. Following the publication of the police report, Yle reported that there were more cases of racism and related physical abuse in Finland in 2011 than at any other time in more than 10 years. [Source] The news report also pointed out that hate crime and racism are not recognized as criminal offences in Finland's criminal code. This puts into question the objective of the annual hate crime report published by the Police College of Finland and the Ministry of Interior's Police Department since 1998. Statistics should not be gathered for the sake of it. Hate crime statistics, which have been gathered for over a decade, should be used to push for legislation against hate crime. It is incomprehensible that the Criminal Code of Finland sanctions "ethnic agitation" (see Chapter 11, Section 10) and does not sanction racially motivated physical abuse or hate crime that could result from such agitation. "Monitoring" hate crime and publishing yearly statistics without hate crime legislation to deter perpetrators does not make sense. Statistics are not a deterrent. There is a need for hate crimes to be recognized as criminal offences in the Criminal Code of Finland, especially in light of the 2011 hate crime report that paints the grimmest picture of racially motivated hate crimes in more than 10 years. Racism is a real problem in Finland and there is a lack of political will or leadership to address the problem. This explains why a Member of Parliament of the "True" Finns Party, Teuvo Hakkarainen, could make a racial slur on his first day in parliament against people of African descent and get away it. In a country where racism and racially motivated abuse are not tolerated, he would have resigned. Perpetrators of racism face no real consequences. Believe it or not - racism damages Finland's image and the image of its people. My Google Analytics (GA), a service that gathers statistics about visits to a website, shows that internet users are curious about the state of racism in Finland and that many people are searching the internet for related information about Finland and Finns. Some users searching for information end up on my blog, and according to GA, keywords about Finland that landed people on my blog between 21 November 2012 and 21 December 2012 include: "finnish people are racist", "are finnish people racist", "finland racial law", "racism in finland", "finland racist" and "finland xenophobia". Perpetrators of racism might think they are damaging the lives of their victims, but they are also damaging the image of their country and how they and their compatriots, the majority of whom are not racist - in my opinion - are perceived internationally. Racism is a double-edged sword. It negatively impacts both the perpetrator and the victim. 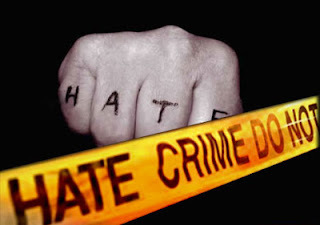 Make no mistake, not all hate crimes are reported or brought to the attention of the police. It is therefore plausible to conclude that the figures published by the Police College of Finland and the Ministry of Interior's Police Department are not representative of the real situation on the ground.